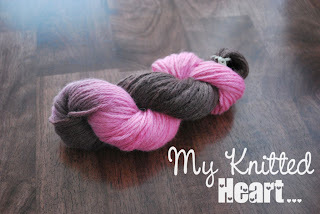 My Knitted Heart: Yarn Dyeing Tutorial Coming Soon!! Yarn Dyeing Tutorial Coming Soon!! Dyed some yarn this past weekend. I didn't take pictures during, because I wasn't sure if it would work. I'm going to take some pictures so that everyone gets the idea of what I did, and I'll post them together with the tutorial. Till then....here's what one of the skeins looked like after I dyed it. I used brown and pinks, which are probably not everyone's favorite colors, but you can use any colors you like.